Previously we have introduced you with the general idea in the aspect of character adding points and cultivation, while today, I’ll talk about the equipment part, where a suit of good equipment will affects greatly on the players’ overall increment. The equipment system of “Chrono Tales” is exclusively made, where similar equipment, through the different cultivation and matching of players, will show a completely different effect. The good and bad of the equipment’s cultivation, may directly affect the victory of a battle. Now, some players may have questions, why that the class I’m playing is a sorcerer, which is a Magic career, but my weapons have Phy. Attack? Here I’ll tell you; this is just the setting problem of the equipment. Physical attack players will just have to focus on the Phy.ATK while Magic attack players just have to focus on Mag.ATK. Equipment system is divided into two main pieces that is to forge and to convert system. 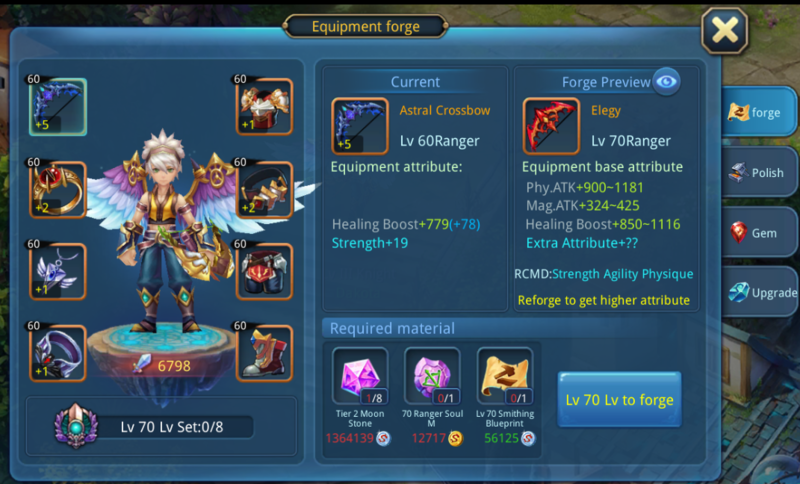 First of all, let’s us look at the forge of equipment, initially, our equipment level is Lv.30, through the use of moon stones, soul stones with the corresponding level and class, and blueprint of corresponding level, in addition of the corresponding level of the role itself, you are ready to forge the equipment. 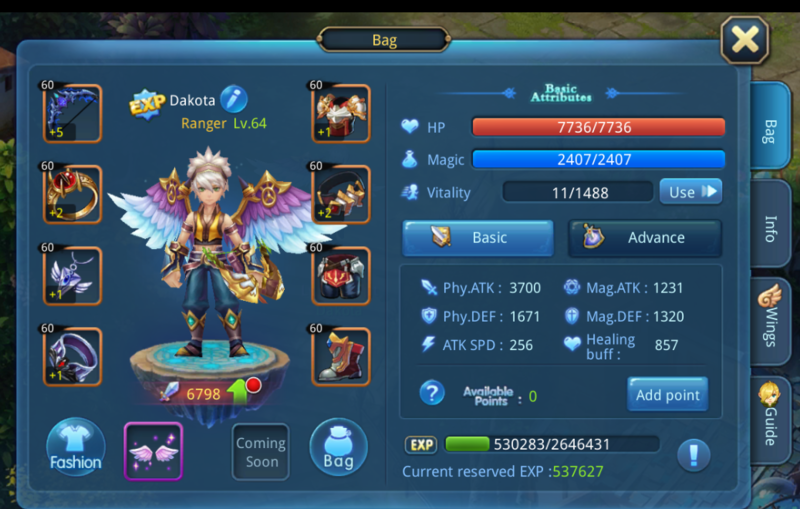 The moon stones can be gained through silver market, Celestial Tower, arena points exchange and bounty quest; while soul stones can be gained through gold market, ancient demons, BOSS challenges and instances play; forge blueprint can be gained through silver market or craft it from the tailor by consuming vitality. 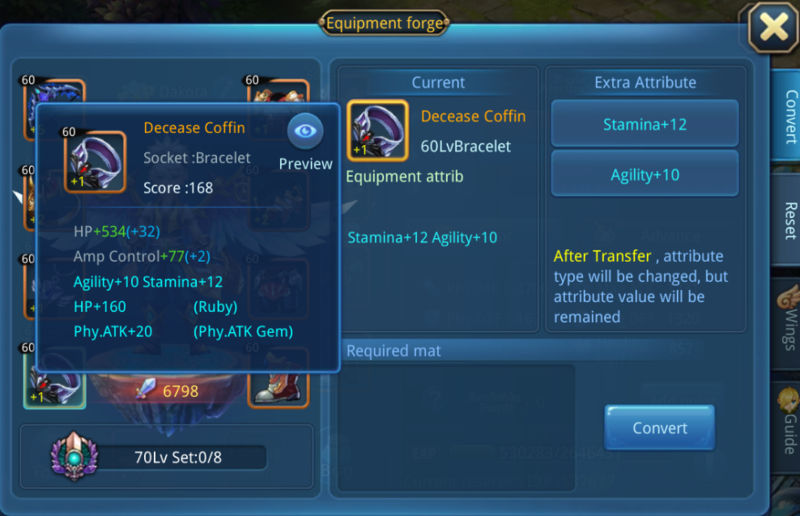 I hereby recommend that you quick upgrade all the equipment when it reach a corresponding level, as 8 same level equipment will have additional attributes. Each equipment can gained additional attributes and effects; there might even appear powerful skills effect! Players can click on the equipment and preview through the small eye to see what effects will there will be. If the attributes and effect are not satisficing, you can re-forge by consuming soul stones and blueprint, re-forge will randomly appear new additional attributes and effects, if there is awesome effect forged, that would be great! The Gem system in the game is very easy to understand, you’ll just have to spend a certain amount of gold to buy gems in the gold market, Gems can be used to upgrade and remove it anytime. But all players have to take note that you need to match it reasonably according to your class, in initial stage you can embed the gem according to the system’s recommendation, while later you can adjust it in a accordance with the equipment’s additional attribute and character’s add points, the growth of every equipment is unique. Take note that every upgrade, the Lv.1 gems required will be more and more. Besides that, the enhancements of equipment, when players reached Lv.50, the equipment can be enhanced through the consumption of enhance stones, but there is a risk when the upgrade fails, and got degraded. But if you use Protection Talisman can remove the risk of downgrade. When the equipment of whole body reached a certain level, there will be increment of attributes. Here’s the end of equipment’s forging. Below I’ll talk about the conversion matters. 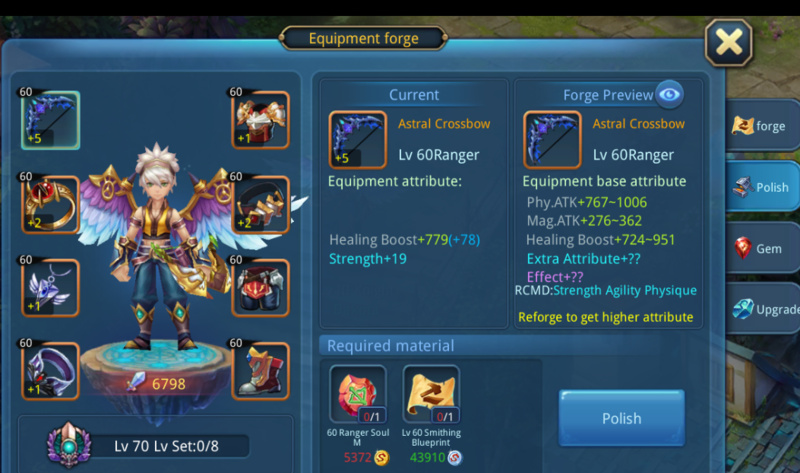 Conversion can change the attributes composition of the re-forged equipment without changing the attribute points, for example, the additional points as +10 wisdom, after re-forge the +10 will not change, but will randomly change into stamina, strength or others +10. Hence, you can maintain the high numerical additional point and get the attribute you want. Equipment reset is under the condition when equipment effect gained, by using reset stones to change the attributes, but at the moment, there is no ways to get reset stones, hence regarding reset, we can wait first. Alright, that’s all for today’s subject on equipment, we’ll meet again next week!